It was a seesaw of a game that the Grizzlies tied the series on. Built on runs, both teams had their chances of putting each other away, but the Grizzlies took advantage on the back of Zach Randolph which brings us to Game 7. Based on what has happened in the entire series, this game will be a dog fight. Both teams will be out there putting everything on the line to face Dallas in the Western Conference Finals. So what do they need to do to get this win? Give Z-BO the ball and get out of the way! In their losses this series, not including the triple overtime thriller, Randolph took less than 20 shots, 13 in Game 2 and 9 in Game 5 to be exact. The man cannot be stopped by anyone that OKC throws at him, Memphis have to give him the ball and let him go to work. I liked the inclusion of OJ Mayo in the starting lineup for Game 6, it gave them an extra threat on offense and possibly caught the Thunder off guard. Along with Conley he gives Memphis another true outside scoring option. Marc Gasol by his standards had a pretty quiet game statistically last night but it did not impact negatively on the Griz, hustle plays made up for not having his usual double-double. How ever he plays really can’t hurt their chances of winning. Tony Allen is the spark for the Grizzlies, I’m expecting him to play big minutes, give them more second chance opportunities and win those 50-50 balls. Allen and Randolph are the guys that give this Memphis team its blue collar identity. The big disappointment in Game 6 was Kevin Durant, he started the game hot but after getting two early fouls he couldn’t get it together. If this happens again Durant needs to get himself going by taking the ball to the hole and not settling for jump shots like he did last night. As the floor general, Russell Westbrook has to see this and help his fellow superstar out. A lot of responsibility falls on Westbrook’s shoulders, much like Derrick Rose for the Bulls, he is one of their main scoring options. He has to lead the team, play smart basketball, limit turnovers and I would like to see his assist numbers up. I don’t think he utilizes his teammates enough, especially when he has someone like Kevin Durant beside him. Finally OKC have to do something about Zach Randolph, the man is killing them one on one on and off the block. It could be too late to try new things but just for the first quarter of Game 7 they should see how he responds to help defense or a hard double team. We haven’t witnessed Z-BO’s passing ability out of the post these playoffs, he has just been a black hole, but a very good one. 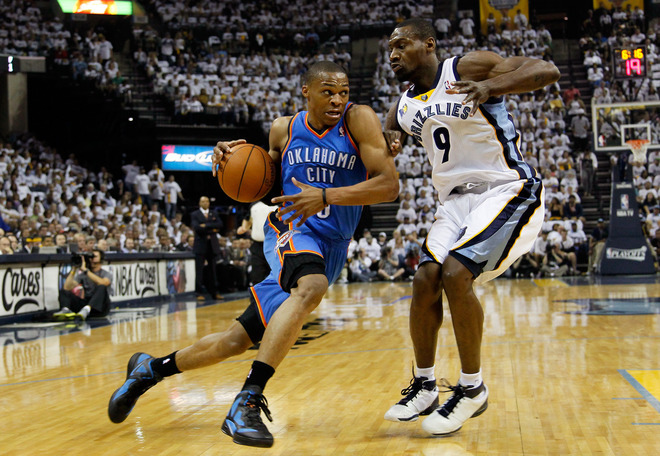 As good as the Grizzlies have shown they can be, it is Oklahoma City’s game to lose. More specifically Westbrook’s game to lose, unless Durant shoots 3 from 14 like he did in Game 6 all the fingers will be pointed at Russell. He needs to think less on being a scorer and more on being a point guard, he is still very young and will learn this as he gets more experience under his belt but lets hope he can learn quickly for Game 7. I have been a fan of the Grizzlies and all that they have achieved these playoffs but I will have to side with OKC going through to the Conference Finals. However I would love to be proven wrong..
Do you have thoughts on this topic? Reply in the comments section. We are now on Facebook click here to visit and ‘like’ our page. Follow us on twitter @hoopsweblog and subscribe to get regular updates. How far can the Grizzlies go? The Memphis Grizzlies may be an 8 seed in these playoffs however they have much more potential than what your usual 8 seed would go about business. 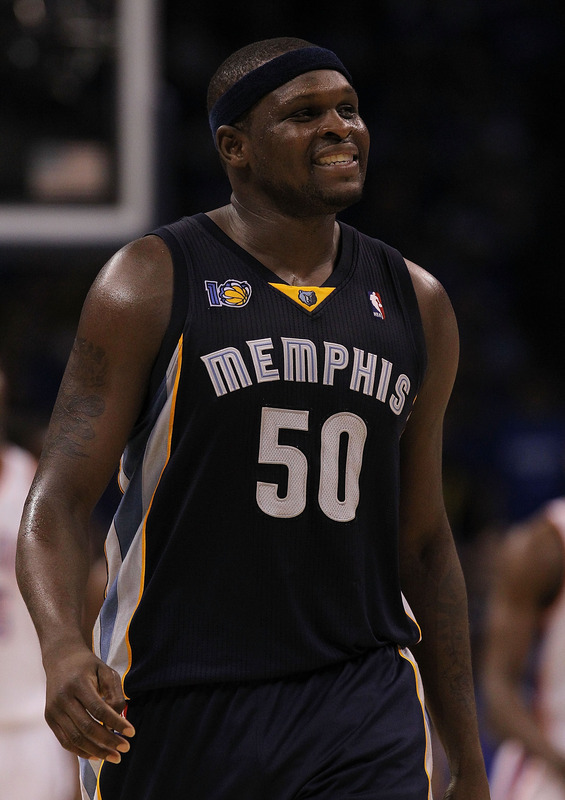 Behind who I am calling the most deceptive player in the league, Zach Randolph. The guy that looks like he could lose a couple of pounds and doesn’t have a vertical to jump over a coke can is absolutely destroying any big man that he has come up against. So how does he compare to Latrell Sprewell? Why Latrell Sprewell you might ask? Of the four eight seeds that have advanced past the first round, including this year’s Grizzlies, the 1999 New York Knicks were the only ones that got even further. They went as far as the NBA Finals where they were derailed by Tim Duncan’s Spurs in five games. The only similarities Randolph and Sprewell have are that they were the leaders of their respective eighth seeded teams. However this by no means counts out the Grizzlies from going to the conference finals. We have seen them take away home court advantage from the favored Oklahoma City Thunder by winning Game 1 and dispose of the number one seeded Spurs team as well, so what is their actual potential. Matching the efforts of the 1999 New York Knicks perhaps? It is very hard to say, but it is definitely not out of the question, what they have achieved so far has created a lot of believers. Although I am not one of them just yet, the Griz have been very consistent with their play for now but I still question how long they can keep this high level of play up. They will have to win a couple more games to make a believer out of me. If they get through this round they have the possible match ups of the Lakers or Mavericks in the conference final. Another question we should be asking is can Oklahoma City beat them? Yes they can, they are the four seed, the numbers say they should be able to. The Memphis bigs however are proving too hard to handle, Marc Gasol and Randolph are a huge force and not even Kendrick Perkins or Serge Ibaka (I-Blocka) can do much about it. The two combined for 54 points, 23 rebounds and 6 assists. Kevin Durant has always been a bright spot for the Thunder, their other All-Star, Russell Westbrook, continues to struggle by his standards. He had 29 points but on 9 from 23 shooting, 6 assists but 7 turnovers. In order for OKC to get over that hump, Westbrook will have to start being more efficient. Bottom line is it’s anyone’s game and if everyone comes to play it is just a bonus for us, the fans, who get to see some awesome playoff basketball. Here are the highlights I have drawn from the first round, if you think I’ve missed anything please add it in the comments section. The Grizzlies were written off before the playoffs even started and they are now in the second round. They are not the team we thought they would be! This man did everything he could to keep the Magic in the playoffs, if his team mates did the same Howard wouldn’t have to be killing the rumors about being traded or free agency. Chris Paul showed the world that he is well and truly back. If the All-Star point guard carries this form into next season I’m sure his name will be mentioned in the MVP conversation. Those unstable knees of his didn’t keep him grounded for too long. B-Roy came up big in Game 4 and made it clear that the Blazers could still depend on him. Always a beast on offense, averaging 32.4 points in the series, including two 41 point performances. No one can guard KD. More like Serge I-Blocka! He had 9 blocks in Game 5… 9! And averaging 4.8 in the series, Ibaka is turning into a key player within that OKC defense. I’ll have to that this was expected, playoffs are the time for stars to shine and that’s exactly what Miami’s Big Three did, proving to be too much for the 76ers. Boston was the only team to sweep in the first round. The old guys look very fresh and will be trouble for the Heat in the next round. The 8th seeded Pacers showed a lot of fight against the Bulls, they showed that they weren’t going to be a push over like any regular eight seed. Interim coach Frank Vogel can take all of the credit for getting these guys to come out and compete every night. They had the best regular season record but this meant nothing to their first round opponents. The Spurs looked old and battered, Z-Bo had his way with their bigs and Manu wasn’t Manu after that elbow injury. It’s rebuilding time for the Spurs this offseason, happy fishing! It would be very optimistic to say that the Knicks had a chance to beat the Celtics in this series. But getting swept is very disappointing, I thought they had at least two wins in them. It will be a very eventful offseason for them too. I think his parents fed all the tough pills to Marc when they were little. Pau struggled against the New Orleans big men, his numbers were way down from what they were during the season. If your name is not Dwight Howard and you play for the Orlando Magic watch out because the guys upstairs will do anything to keep Dwight happy. After their performance these playoffs I don’t think anyone’s job is safe within Orlando. He is an NBA All-Star and one of the leaders on that team. But if you have Kevin Durant on your team you can’t be taking more shots than the best scorer in the game. Westbrook will have to make better decisions when it comes to the next round. Follow us on twitter @hoopsweblog. Subscribe to get regular updates about what’s happening in the basketball world. Miami Heat: Their Championship to Lose?